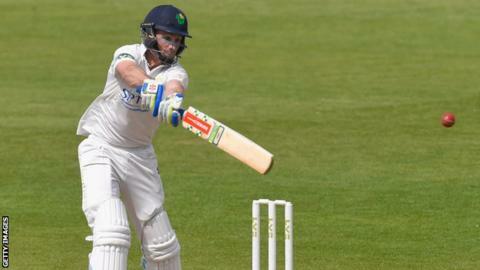 Mark Wallace believes Glamorgan could still reach an improbable 462 to beat Essex on the final day of their County Championship Division two match. The Welsh county were bowled out for 162 in their first innings at Chelmsford but reached day three on 110-1, with Will Bragg the man out. "It's a big target to be chasing down," said wicket-keeper Wallace. "But when you're looking at a target like that you take it in small chunks, we'll see where we are at lunch." "If we bat all day and bat well I think the sun is going to shine and it's a pretty fast outfield, so you never know. "The pitch has certainly flattened out; we underperformed with the bat [in the first innings], we won't hide behind that - we were probably 100 short of where we should have been." "The two boys who did the lion's share of the work - Aneurin Donald and Jacques Rudolph - played very, very well."